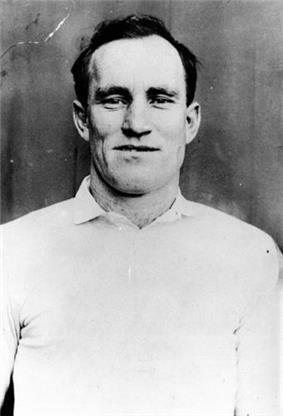 Herbert Henry "Dally" Messenger (12 April 1883 – 24 November 1959) was one of Australasia's first professional rugby footballers, recognised as one of the greatest-ever players in either code. Messenger, or 'The Master' as he was dubbed, represented his country in two rugby union tests and seven rugby league tests. He played for New South Wales in the very first rugby match run by the newly created 'New South Wales Rugby Football League' which had just split away from the established New South Wales Rugby Football Union. Messenger had a stocky build, and while standing only about 172 cm (5 ft 7') in height, he was a powerful runner of the ball and solid defender. According to his peers the centre's greatest attributes were his unpredictability and astonishing physical co-ordination, coupled with a freakish ability to kick goals from almost any part of the ground. He was a teetotaller and non-smoker during his career and other than breakfast, Messenger would rarely eat before a match. Messenger was born in the Sydney waterfront suburb of Balmain, New South Wales, and grew up in another of Sydney's waterfront suburbs, Double Bay, where his father owned a boat shed. He also spent some time living with an aunt in South Melbourne, Victoria, and he later recalled playing a game during this period which may have been "Victorian rules football". In Sydney, Messenger attended Double Bay Public School in the city's eastern suburbs. It was here that he initially honed his rugby skills, while also playing cricket and indulging in his other great sporting love, sailing. Messenger worked, too, at his father's boat shed. By this juncture, he had gained the nickname of "Dally". It derived from a prominent politician of the 1880s, the then Attorney-General of New South Wales, William Bede Dalley, whose most conspicuous physical feature was a splendid pot belly — an anatomical augmentation that Herbert Henry Messenger happened to boast, too, when he was a small child. Fortunately, little Herbert Henry shed his pot belly as he grew older, together with the "e" from the spelling of his nickname. 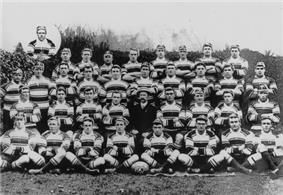 Messenger first took up competitive rugby in 1900, playing for a local rugby union club called the Warrigals in a semi-social club competition. Over the next few years Messenger continued to play with the Warrigals, persistently rejecting calls by officials of the Eastern Suburbs RUFC to move up to the higher standard of Sydney's grade competition. In 1905 he finally began playing for Easts in the club's second-grade team, but showed sufficient promise to earn promotion to the first-grade side on two occasions that season. In that same season, he also purportedly played Australian rules football club in a number of first-grade matches in the Sydney competition. Messenger began the 1906 season in first grade with Easts as a 'standoff' (five-eighth). He swiftly won a following amongst the club's supporters due to his mesmeric ball skills, cheeky tricks, blistering acceleration and accurate short- and long-kicking game off either foot. Messenger moved to what would become his customary position of Inside centre following his selection there for the New South Wales team in 1906. By the time of his Wallaby debut in 1907, he had made that position his own. In the book Viewless Winds, the 1906 representative footballer Paddy Moran wrote that Messenger's play "was full of surprises, unorthodox, flash" and "directed largely by the unconscious mind". He said that Messenger "never became a slave to copybook practices" because his "instinct enabled him to see and take an opening in that operative second which is all-important". Moran compared him to Bradman in terms of their mutual ability to instantaneously co-ordinate their bodies into the right position in apparently ample time before the ball would arrive. When talk of a professional rugby competition, or a Rugby League, was being aired, Messenger was instantly interested by the development. He was approached by a consortium that included Test cricketer, Victor Trumper with friend J. J. Giltinan, who knew getting Messenger on board would be a major boost for the new code. He signed on with the new professional code in 1907. As the premier rugby footballer of the time, Messenger's signing is considered the integral moment in the substantiation of rugby league. After he became a rugby league player, Messenger's rugby games were struck from the record books of the New South Wales Rugby Union and not restored for a 100 years. Messenger played in the rebel series against a professional New Zealand team, the 'All Golds' as they were referred to, and was invited to tour England with the New Zealand professional side. It remains unclear whether this was a result of the form he showed in the series or if it had been agreed on as part of his sign-on fee with the new code. It was said, and believed as Messenger family folklore for years, that the signing of Messenger to rugby league was negotiated with Dally's mother Annie, and the promised amount for playing, at first, in three All Golds' games, was 50 pounds. It was in the North of England that Messenger became more acquainted with the new game. By the completion of the tour Messenger had topped the tour aggregates by more than 100 points. On arrival back in Australia, Dally played with the Eastern Suburbs club of the newly formed New South Wales Rugby Football League (NSWRFL), although a heavy representative schedule saw him play only a handful of matches for the club. Messenger's popularity helped showcase the new game and the NSWRFL took full advantage of this. In rugby league's first year, besides playing for his club, Messenger made representative appearances for Metropolis (Sydney), NSW and Australia as well as for New Zealand and, in one case, Queensland, he also represented Australasia. Following two heavy defeats, Messenger agreed to play for Queensland in a third match against New Zealand. The match ended in a 22 all draw with Messenger scoring nine of the 22 points. Towards the end of the season Messenger was again selected to tour England, this time with the first Kangaroos, or 'Pioneers'. Having toured with the New Zealand professional team the previous year, Messenger was well known in the North of England and on arrival attained celebrity status. Placards bearing the words 'Messenger Will Play' were erected outside of grounds. Messenger was offered contracts by leading soccer clubs, including Glasgow Celtic, Newcastle United and Tottenham Hotspur, but refused them. Messenger captained Australia in the first two tests of the tour, missing the third through injury. On tour Messenger was credited with numerous goals from the other side of half way, including one from the sideline on his own 25-yard line that appeared in earlier versions of the 'Guinness Book Of World Records' as measuring over 80 yards (73m). Another from over 75 yards is mentioned in an English newspaper under the heading 'A Wonderful Kick', ".
" Quite a sensation was caused at last Saturday's football match when Mr Messenger kicked the ball from the 75 yards' mark and secured a goal....."
In the second test Messenger is said to have scored one of the greatest individual tries ever witnessed in Test rugby league. At the end of the tour Messenger had again topped the aggregates, this time by just under 100 points. Returning home from the tour with injury and following a hectic schedule over the past few years, he elected to sit out most of the 1909 season, playing in just a few representative matches towards the end of the year. Messenger also rejected an offer to play with English club, Warrington, during the Australian off-season that year. Messenger was captain of Australia when they hosted the 1910 Great Britain Lions tourists. The 1911 season has been acclaimed as Messenger's greatest. In 21 matches played he amassed a then record total of 270 points. In one interstate match for NSW he scored 32 points (from four tries and 10 goals). That record has only been equalled in recent years, with tries now being worth 4 points as opposed to 3. He amassed a total of 72 points for the three match series. Recently married Messenger stood down from the 1911–12 Kangaroo tour of Great Britain, leading his club Eastern Suburbs to its first premiership. In the semi-final that year against South Sydney Messenger scored 20 of Easts' 23 points. For each of the three consecutive seasons 1910, 1911 and 1912 he was the NSW Rugby Football League's top point scorer. After retirement from representative football, he led his side to a second premiership in 1912 and followed that with a third consecutive premiership in 1913. Easts were given permanent possession of the NSWRFL's first trophy, the Royal Agricultural Society Shield. On announcement of his retirement, the Eastern Suburbs club presented the shield to Messenger in appreciation. He was awarded Life Membership of the New South Wales Rugby League in 1914. Dally Messenger is listed on the Australian Players Register as Kangaroo No. 10. 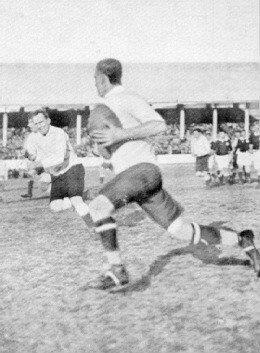 Messenger inside Dan Frawley in action for NSW v Qld 1912. In addition to his rugby prowess, Messenger was a talented cricketer, canoeist and sailor. After the end of his rugby league career, he ran a couple of hotels in Sydney and Manilla, New South Wales and a banana plantation in Mount Buderim, Queensland. He later worked as a carpenter in the NSW Department of Public Works. The Courtney Goodwill Trophy, international rugby league's first trophy, was presented initially in 1936 and depicted Messenger, along with three other pioneering greats of the code, namely Jean Galia (France), Albert Baskiville (New Zealand) and James Lomas (Britain). The Dally M. Medal is awarded annually to Australian rugby league's best player, as judged by an expert panel of commentators, whose votes are tallied at the conclusion of each regular playing season. A stand at the Sydney Cricket Ground has also named after Messenger, in recognition of his many outstanding games of club and representative football. In 2003 he was admitted into the Australian Rugby League Hall of Fame. In 2004, the Royal Agricultural Society Shield held by Messenger's family became part of the National Museum of Australia collection. In 2007, a century after he was shunned by rugby union for switching to rugby league for 180 pounds, his playing record was formally reinstated. In February 2008, Messenger was named in a list of Australia's 100 greatest ever players (1908–2007) commissioned by the NRL / ARL to celebrate the code's Australian centenary year. Messenger went on to be named as an interchange player in Australian rugby league's Team of the Century. Announced on 17 April 2008, the team was a selection panel's majority choice for each of the 13 starting positions and four interchange players. In 2008 New South Wales announced their rugby league team of the century also, naming Messenger on the wing. Given Messenger's revolutionary impact on the rugby codes, his lasting fame, and the extraordinary degree to which he dominated his contemporaries on the field, some historians would go so far as to call him the finest player of them all. If he were playing today, however, because of the increased average size of footballers, he would probably be reinvented as a halfback (scrum-half). There is no reason to doubt that he would be just as brilliant in this position as he was at centre. Messenger was immortalised in 2008 by a life-size bronze sculpture created by artist Cathy Weiszmann and erected outside the Sydney Football Stadium. The statue forms the second sculpture in an envisaged 10-part series for the Sydney Cricket Ground Trust's Basil Sellers Sports Sculptures Project. ^ a b c d e "Scrum.com player profile of Dally Messenger". Scrum.com. Retrieved 12 July 2010. ^ The Herald (5 February 2008). "Famous deeds, names mark NRL golden age". TheHerald.com.au. Retrieved 9 August 2009. ^ Quinlan, J (31 May 1922). ""Dally" Messenger "The Master"". ^ Cunneen, Chris (2001). The best ever Australian Sports Writing. Australia: Black Inc. p. 316. ^ "AFL history – Australian football". rl1908.com. Retrieved 16 September 2008. ^ "Dally Messenger – The Master – book". www.rl1908.com. Retrieved 16 September 2008. ^ "AFL's offensive just another battle in a long, long war". Sydney Morning Herald. 23 February 2008. Retrieved 16 September 2008. ^ Toby Creswell and Samantha Trenoweth (2006). 1001 Australians You Should Know. Australia: Pluto Press. p. 717. ^ a b c d Australian Dictionary of Biography "Dally Messenger"
^ "Dally Messenger reinstated to NSWRU record books"
^ Dash, Hugh (18 August 1947). "Hugh Dash's Backstage of Sport". Cairns Post. Retrieved 9 January 2012. ^ Middleton, David (30 September 2013). "Ten of the most dominant seasons in rugby league history from historian David Middleton". The Daily Telegraph. Retrieved 6 February 2014. ^ Tucker, Jim (24 June 2007). "Dally M back in rugby fold". Courier Mail. Retrieved 16 September 2008. ^ Toby Creswell and Samantha Trenoweth (2006). 1001 Australians You Should Know. Australia: Pluto Press. p. 691. ^ Peter Cassidy (23 February 2008). "Controversy reigns as NRL releases top 100 players". Macquarie National News. Retrieved 23 February 2008. ^ Todd Balym (17 April 2008). "Johns, Meninga among Immortals". Fox Sports Australia. Retrieved 17 April 2008. ^ "Team of the Century Announced". ^ ARL (2008). "Australian Rugby Football League 2008 Annual Report" (PDF). Australian Rugby Football League Limited. p. 30. Retrieved 19 July 2009. Messenger, Dally Raymond (1982). The master: the story of H.H. 'Dally' Messenger and the beginning of Australian rugby league. Angus & Robertson.